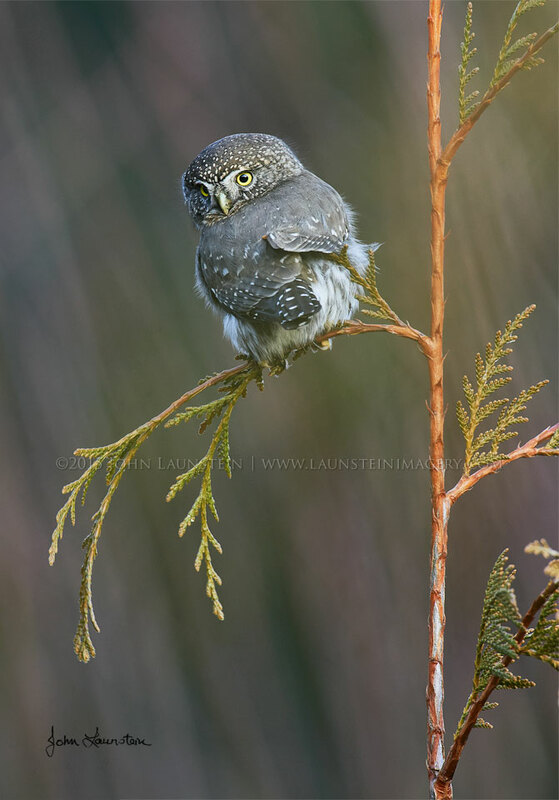 This handsome male Northern Pygmy Owl chose a small cedar sapling for his vantage point while hunting. Averaging just 16-18cm (6-7in) in length including their tails, Northern Pygmies are the smallest owls in Canada. John chose to photograph the owl through a stand of willows, giving a soft, painterly effect to the image. He captured this moment as the owl focused his attention on a bit of movement on the forest floor. Please note: this is a wild owl that was not baited, called, lured-in or manipulated in any way.